How many days without an accident in your plant? 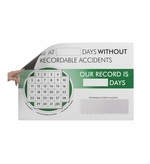 Use our deluxe lost time or days without an accident tracking boards and optional magnetic accessory kits from OptiMA Graphics to easily keep track. 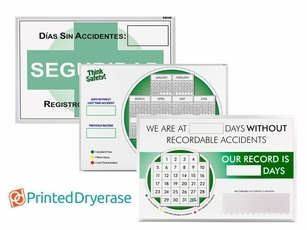 Complete deluxe kits include magnetic receptive dry erase boards with permanent imprints, colored magnetic indicators, markers, wiping cloth and installation hardware. You can order just the boards or add the magnetic accessory kits to your order. You may also wish to check our Economy Safety Boards that simply keep track of the number of days without an incident and your current record at the same time. Same great dry erase writing surface but Non-magnetic receptive. 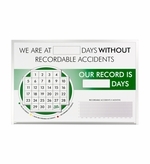 Now safety managers can easily track the number of days without an accident and safe working days without a lost time accident and keep it in plain sight of every employee involved. You can track accident rates for a single month or for the whole year. Either board offers a box for "Days without a lost time accident" and "Previous Record". If you can't find what you need we can custom print any safety board for you in either magnetic or non-magnetic format. We can also make a custom printed wall vinyl too! A non-magnetic dry erase writing surface. Track Number of days without an incident and your record. From "Select Size" "1824: 18\" T x 24\" W (+$39.95)" "203: 24\" T x 36\" W (+$59.95)"
A non-magnetic dry erase writing surface. 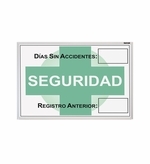 Spanish Incident Tracking Board. 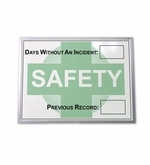 Magnetic Monthly Lost Time Accident Board with Optional Magnet Kit. From "Choose Option" "203: 2' x 3' Board Only (+$119.95)" "203-K: 2' x 3' Board With Kit (+$139.95)" "" "304: 32\" x 45.5\" Board Only (+$195.95)" "304-K: 32\" x 45.5\" Board With Kit (+$215.95)"
Magnetic Yearly Lost Time Accident Board with Optional Magnet Kit. From "Choose option" "304: 32\" x 45.5\" No Kit (+$199.95)" "304-K: 32\" x 45.5\" With Kit (+$245.95)"
18" x 12" Safety Signs. Ear Protection or Safety Glass warning / reminders.